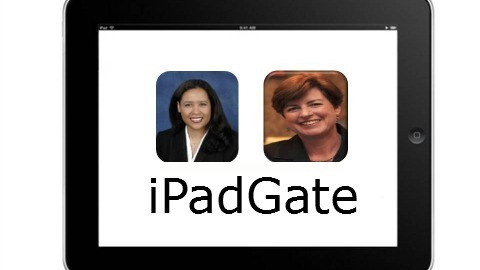 ELECTION ’12//SAN LEANDRO CITY COUNCIL DIST 2 | San Leandro City Council candidate Morgan Mack-Rose accused her opponent Councilwoman Ursula Reed of misusing taxpayers’ dollars by pursuing a proposal earlier this year to purchase iPads for the council’s use. Mack-Rose also faulted Reed for accepting one of the city-issued iPads, but the incumbent Reed vehemently denied the assertion. Lasts January, the council approved buying the popular hand-held computers for council members and some top managers to defray costs associated with the printing and delivering of agenda packets. The decision is not unusual. San Leandro was one of the few remaining East Bay council’s not using iPads instead of bulky agenda packets. The nearby Hayward City Council has be using city-issued iPads since late 2010. Reed said the impetus for the council’s vote to purchase iPads was a cost-cutting measure, not an extravagant use of taxpayers’ money and saves the city $20,000 annually on photo-copying. “There’s all these things that we can cut that are actually frills and we don’t need frills.” Reed added. In fact, Reed is correct. According to the city’s Information and Technology Department, Reed was never given a city-purchased iPad for her use as a council member. It is not the first time Mack-Rose has offered a falsehood to voters this campaign season. At a candidates forum last week, she erroneously said the city’s faced a budget deficit last year when it had not and has proffered a tactic warning voters the city’s settlement with Faith Fellowship Church would bankrupt its treasury when, in fact, the expenditure would come out of a self-insurance fund. Mack-Rose also levied a potentially more serious allegation against Reed Tuesday night when she accused her of gaining the endorsement of public safety unions as a quid pro quo for the current labor negotiations between the city and labor. “You heard my opponent has the personal endorsement of the police and firefighters union, but, let’s be clear,” said Mack-Rose, “those endorsements and the campaign funds that come along with them is about the current contract negotiations as much as anything else.” Mack-Rose denied the use of the term, “pay-to-play,” but stood by her statement, nevertheless. Reed again denied the accusation saying, she received the endorsement of public safety unions four years ago and labor tends to stay loyal to a candidate. She also said the amount of financial support from the unions has been negligible—just $500 from the firefighters—along with permission to trumpet their endorsement on campaign lawn signs. Posted in iPad, labor, Morgan Mack-Rose, public safety, S.L. City Council, SLD2, Ursula Reed. Bookmark the permalink. Which candidate is a strong advocate for marijuana dispensaries and had a warrant for pot possession? Tom Abate came to the Patch after a very very short time at the North Coast Journal. It appears his mental health and bad attitude were in downward spirals. The near bankrupt Patch is the only place this a** could land. Knowledge insurance sales person still not working, begging for donations all over town. Integrity Crow lies about pot ticket and warrant were never existed until police kick him off the patrol car. HolyShit!!!!!!!!!!!!!!!!!!!!!!! I just listened to that sound bite of Tom Abate and that guy is legit crazy……..5150 status…. Steven There should be a mini article just on that craziness!!!!! put Crow in the mix and Tim Holmes and we got a recipe for disaster in this place.. Some of our senior citizens should know these craziness in our town, cant trust San Leandro Times! Why only 3 pics of candidates – thought they are 9 of them! Oakland Tribune, Daily Review along SL Times are tied. Twisted of words, omitted contents. Chamber of Commerce is a group of lousy, stupid small town businessmen – why in world endorsing someone “two of them” have no proven of records of any kinds of corp. business projects plus both are unemployed. Heard the remix of Patch editor, Tom Abate, was some crazy dude!! Chris Crow made some deals with every single one of his endorsors. A union labor guy is roommate of Crow thats how Crow got his endorsements from the union labors. Crow and chamber of commerce against residents, both promised Halus on windmill deal. How many jobs can Halus offer for 1 windwill? Chamber of Commerce endorsed Crow because 1 windmill business to against the Heron bay 700 homeowners – GOT IT! Chris crow removed Corina Lopez's signs when he was dating Pauline Cutter's daughter. Tim Holmes is one strange dude. So if Morgan Mack-Rose left her husband then why does she still use his name? She's a big woman, was her alleged lover also large?